Never underestimate The Power of Color. Learn the confidence of choosing color. I want to give you the confidence to use color. It is much more than just a color. It is a visual stimulus. Color can evoke a taste, a smell, a touch or a feeling. It can trigger remembrances of time past and present. Color is powerful. I want you to understand why a color can evoke a certain feeling and to explore it. Surrounding yourself with color can bring about change, rejuvenate, inspire, and invigorate your life. Color can wrap you like a warm wool blanket on a cold winter day. I want you to have the confidence to experiment with color, to adventure outside the main stream, to branch out to try different shads and tones from the bright and vibrant to the faded and subtitle. Warm colors can cheer you up, re-charge your energy and make you smile. It can be a repository of good feeling and good memories when painted on a wall of a kitchen, den, bedroom or living room. If a color can make you smile, feel content, and relax on the beaches of Aruba or a new England country lane in the fall, than it can make you feel the same way after a long day of work. Make color work for you. Experiment and create a living space where you will always feel at home. Color and the effective use of color go well beyond just improving the feel of any home. I have seen doctor’s offices and medical facilities transformed through the use of inviting colors, from a space where patients who enter suffer from “white coat syndrome”, to a place where patience actually feel relaxed and comforted. Businesses, restaurants, malls, and offices that I have consulted have all said that altering their use of color has completely changed how both employees and customers feel about their surroundings. The reported that sales, production, and the over all work environment have greatly benefited from the color changes that were made. Color has that kind of power. 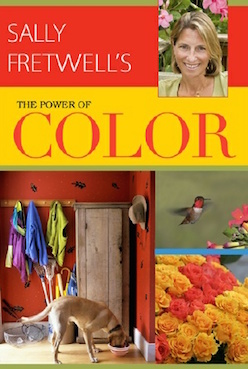 From the work place to the home, color had both physical and psychological effects on us. It can make you feel better emotionally, become more uplifted, less tired, more relaxed, and in general affect your over all well being. All of these things achieved by a simple coat of paint… that’s the “Power of Color”. Any of Sally’s books may be purchased on Amazon, in fine paint stores, or directly from her by simply emailing or calling her through this web site. If you decide to order Sally’s books directly from her, you will save a considerable amount of money over the retail prices found in stores. The prices above reflect those discounts from the retail prices. Any of Sally’s books may be purchased on Amazon, in fine paint stores, or directly from her by simply emailing or calling her through the “CONTACTS” link on this web site.